As a result of our proven success at the education centers in La Carpio, we have now decided to branch out to other areas of the country. The name of all our centers will now be “Centro de Bienestar Familiar” or Family Well Being Center. We have found that, through providing quality education and care programs for young children, we can strengthen the bond between the child and the mother, thus improving family interactions. As the mother and child grow in harmony, the father is often more encouraged to participate in the family circle and thus, we create a more balanced situation in the home. Well being becomes a part of all members of the family. With this in mind, Fatima, one of our most experienced Carpio teachers, moved with her family to Rio Claro, a community right on the Panama border. Since she has been working for so many years in Carpio, she was able to make a positive impact on the children and families in this new community and has created the Family Well Being Center of Hope Rio Claro. With the support of the Lifeworks groups, she has created a space, made furniture and carried on with classes for the children all year long. We are so proud of what she has accomplished. Our other new center is located at the beach town of Uvita on the west coast. We have assumed the responsibility for the Forjando Alas program started several years ago in order to educate children who live in the beach community to share their love of nature with visitors and, at the same time, to protect these children from falling prey to the drugs, trafficking and prostitution that tends to be prevalent in these areas. The Family Well Being Center Forjando Alas attends about 30 children with activities to strengthen their self esteem, academic skills and realization of their special ability to resonate with nature. Thanks to the assistance of the Overland groups, we were able to begin the construction of a new classroom site and will continue to work on the completion of the building as funds become available. The third new program is located on the northern border of Costa Rica where there is a constant flux of refugees from Nicaragua who cross the border in a desperate attempt to find basic sustenance for their families. Nela, who once lived on the streets of San Jose, is in charge of this program and, along with her daughter Kela, provides a program for these very vulnerable children with basic academics, eco camp program and snacks. We have learned a great deal about the reality of the situation in Nicaragua from this program. Our programs are unified through the use of two curriculums we have designed. The first was developed over the years by Fatima and her family and covers topics of importance for children in vulnerable circumstances with topics as varied as “What to do if your brother gets hurt in a gang situation” to “How to care for animals”. We have materials to help children face the challenges and joys they have every day. The second curriculum is called “Walk a Mile…in My Shoes” and is bringing awareness to all of our children and teachers about the realities of being a refugee and living in poverty. We challenge all the participants in this series of activities to analyze their own lives and to dream of being more than they have been in the past. This program will culminate in an exhibit in a highly public place at which all the works of art, theater, dance and research of the children and teachers will be shown. The opening night of the exhibit will provide a chance for many different people to express in public what they have gone through or what they hope for in the future. 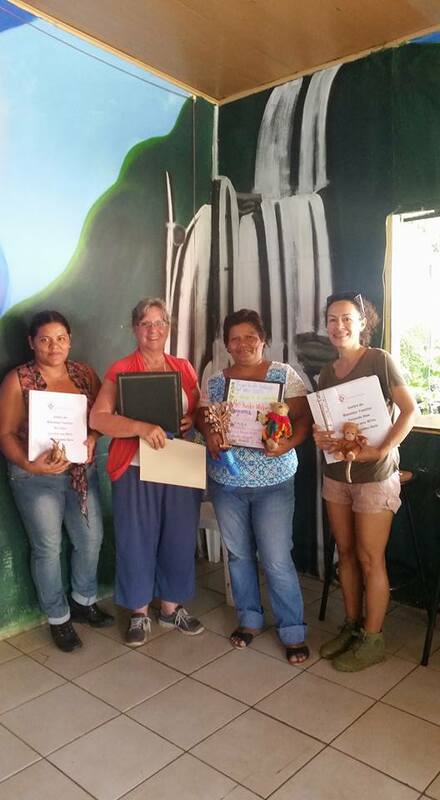 For all of these programs to have success, we have elicited the assistance of many volunteers both from Costa Rica and outside. We are proud and happy to have put together these projects and look forward to sharing all of this with our very valued volunteers and their leaders.